On the way to my uni’s sports day a couple weeks ago, we stopped off at a famous temple (from the ancient “kao noi ka mae” story) where they sold various trinkets, sticky rice baskets, and musical instruments at a series of stalls on the dusty temple grounds. After testing out this drum and hearing how nice it sounded, my coworker and I debated about who should buy it. He said he had too many drums already, so I bought it. 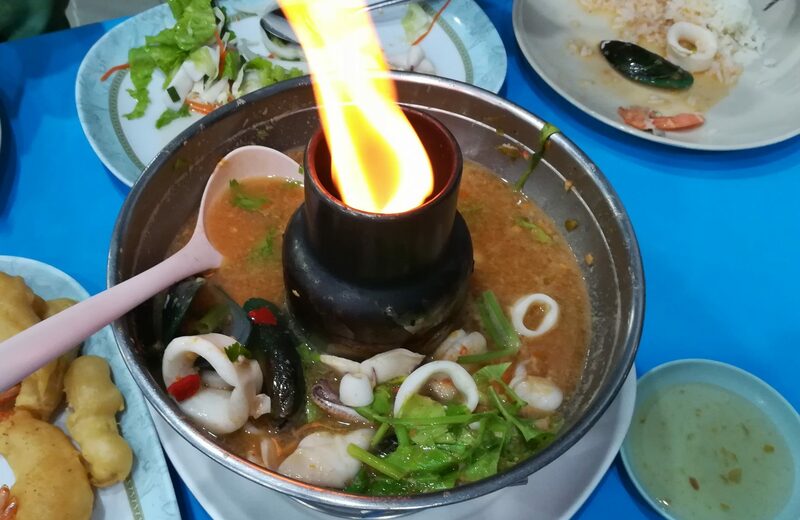 The man who sold it to me didn’t say who made the drum, who killed the snake, or if it tasted delicious, and I didn’t ask. 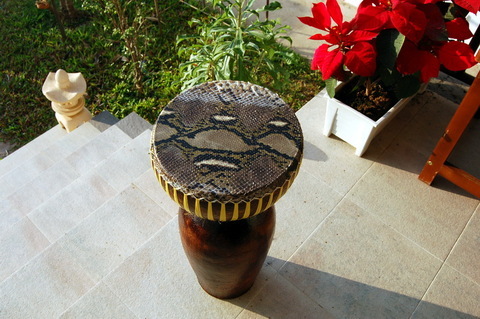 Just having a drum with a snakeskin head is cool enough. One thing was kinda gross, though. The first day of pounding on it, scales were flying off everywhere. I looked down once to find my forearm covered in snake scales that were sticking to my sweaty skin. It was djembeistic and cathartic as hell. I will cry out loud when this thing eventually breaks, it’s way too cool. 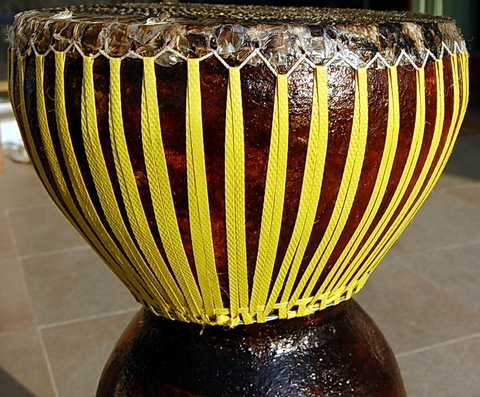 How’s the overall vibrational tone of the glazed ceramic body compared to the wood body djembe? How big are the scales of the snake’s head? Do you have to oil the skin to help preserve it? Are those poinsettias in the planter behind the drum? Just wondering ‘cuz you know already that they’re toxic to babies…. And which side sounds better, head or tail? By the way, poinsettias are toxic to dogs. That’s what I heard . Because it contains xylitol in the stems and leaves. So these days animal food makers started developping xylitol-free dog foods. So I think you better buy some plants with green leaves and paint them red with red soy ink. Then you and baby will be happy, no problemos. I want to play it! Can you upload an MP3 of you playing it or something? The new thing I want is a hang drum. From what I have read, I won’t be able to get one, but I still think it’s cool.